The ActionBar class defines a component that includes title, navigation, and action content groups. The ActionBar control provides a standard area for navigation and action controls. It lets you define global controls that can be used from anywhere in the application, or controls specific to a view. Contains components that let the user navigate the section. For example, you can define a home button in the navigation area. Use the navigationContent property to define the components that appear in the navigation area. Use the navigationLayout property to define the layout of the navigation area. Contains either a String containing title text, or components. If you specify components, you cannot specify a title String. Use the title property to specify the String to appear in the title area. Use the titleContent property to define the components that appear in the title area. Use the titleLayout property to define the layout of the title area. If you specify a value for the titleContent property, the ActionBar skin ignores the title property. Contains components that define actions the user can take in a view. For example, you might define a search or refresh button as part of the action area. Use the actionContent property to define the components that appear in the action area. Use the actionLayout property to define the layout of the action area. For a mobile application with a single section, meaning a single ViewNavigator container, all views share the same action bar. For a mobile application with multiple sections, meaning one with multiple ViewNavigator containers, each section defines its own action bar. The components that define navigation for the user. The components that appear in the title area of the control. In ActionScript, you can use the following constants to set this property: ActionBarDefaultButtonAppearance.NORMAL and ActionBarDefaultButtonAppearance.BEVELED. The skin part that defines the appearance of the action area of the component. By default, the ActionBarSkin class defines the action area to appear to the right of the title area. The skin part that defines the appearance of the navigation area of the component. By default, the ActionBarSkin class defines the navigation area to appear to the left of the title area. The skin part that defines the appearance of the title area of the component. By default, the ActionBarSkin class defines the title area to appear between the navigation and action areas. ActionBar with content in the titleContent skin part, but not in the titleDisplay skin part. ActionBar with content in the titleContent skin part, and components defined in the actionContent property for display in the actionGroup skin part. ActionBar with content defined for the titleContent skin part, and components for display in the actionGroup skin part and in the navigationGroup skin part. 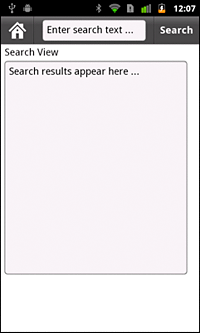 ActionBar with content in the titleContent skin part, and components defined in the navigationContent property for display in the navigationGroup skin part. ActionBar with content defined for the titleDisplay skin part, and components defined in the actionContent property for display in the actionGroup skin part. ActionBar with content defined for the titleDisplay skin part, and components for display in the actionGroup skin part and in the navigationGroup skin part. ActionBar with content defined for the titleDisplay skin part, and components defined in the navigationContent property for display in the navigationGroup skin part. The default value is HorizontalLayout.